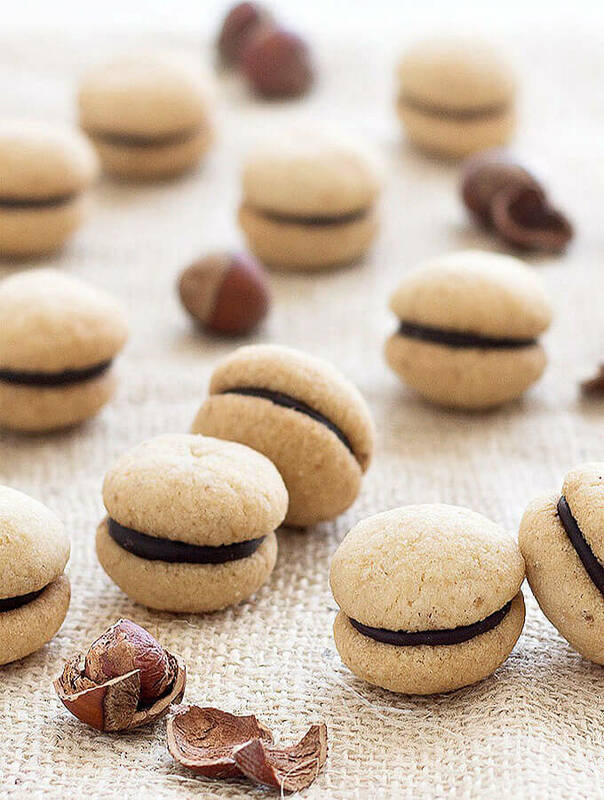 Baci di Dama consist of two buttery hazelnut cookies sandwiched together with a dollop of dark chocolate. They are very delicate and have a melt-in-your-mouth texture that is quite addictive. Baci di dama are cookies typical of Piedmont, the region I come from in the northwest of Italy, known for its sought-after DOP hazelnuts. Piedmont is also rich in other delicacies such as chocolate, the precious white truffles, and wines (Barolo, Barbera, Moscato D’Asti, Asti Spumante, etc). 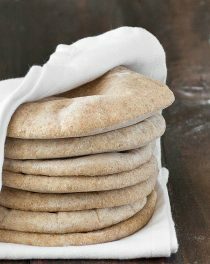 – If the dough is too crumbly and doesn’t hold together, add ice-cold water (start by adding 1 teaspoon). – It’s very important to chill the dough for one hour (or even better overnight) AND the cookies for another hour before baking. These steps help them keep their shape while baking. 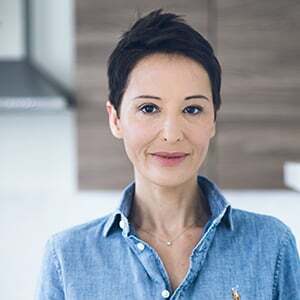 – If the cookies melt in the oven is usually because your ingredients were not thoroughly combined and there is too much butter in that ball of dough. Knead the dough until the butter is evenly dispersed. 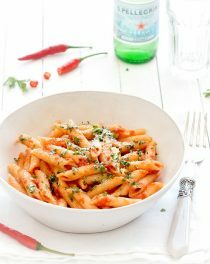 – You can use almonds, hazelnuts or a mix of both. I personally prefer to use hazelnuts. 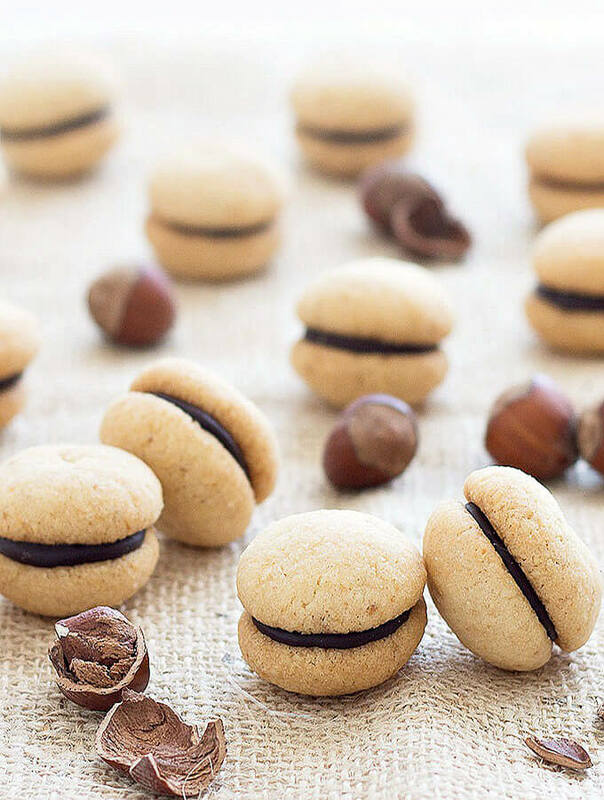 Baci di dama are the perfect cookies to serve to your guests after dinner with a cup of coffee or espresso! Enjoy! For more Italian cookie recipes, be sure to check out my Ugly but Good Cookies (Brutti ma Buoni), Cantucci, and Savoiardi (Ladyfingers). 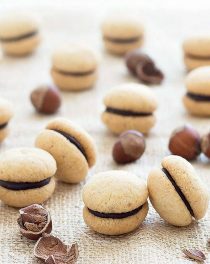 Baci di Dama ( Italian Hazelnut Cookies): two buttery hazelnut cookies sandwiched together with a dollop of dark chocolate. Perfect with a cup of coffee or espresso! Toast the hazelnuts at 160 degrees C (320 degrees F) for 15 minutes, until golden brown and fragrant. Remove the hazelnuts from the oven and rub them in a kitchen towel until the loose skins come off (don't worry about skins that don't come off). Once completely cool, pulse the nuts in a food processor until they resemble sand. Transfer the hazelnuts to a bowl, add the flour, butter, and sugar. Mix all the ingredients together until the butter is evenly dispersed, and the dough is smooth. Divide the dough into 4 pieces and roll each piece into a log. Chill the logs on a baking sheet for 1 hour. Cut off equal-sized pieces (more or less weighing 8 grams each) and roll them into tiny balls between the palms of your hands. Work with one log of dough at a time, leaving the others in the fridge, so they stay cold. Place the balls on a baking sheet covered with parchment paper, slightly spaced apart. Put the baking sheet in the fridge for 1 hour. Bake the baci di dama for 15 minutes at 160 degrees C (320 degrees F ), until they are set to the touch and lightly golden. Let the cookies cool completely before filling. In a clean, dry bowl set over a pan of barely simmering water, melt the chocolate until smooth. Let it cool for a few minutes until it thickens slightly. Put a dollop of chocolate on one cookie and place another one on top. Once filled, put the baci di dama on a cooling wire rack until the chocolate is firm. WOW! This is a wonderful recipe. Your new page looks AWESOME! You did a great job with it. My first thought was, “ahh, those are soooo cute.” And they are cute. 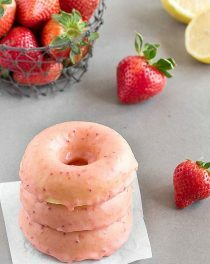 But I’d love a dozen please. We had these while on vacation in Italy and my daughter fell in love. I made these for Christmas and they are wonderful! Hi Michelle! I hope you had a nice Christmas 🙂 I am glad you enjoyed the baci di dama…they are my favorite Italian cookies! I have made these lovely little biscuits twice, once with pistachio and dark chocolate and one with hazelnuts and Nutella, delicious. Thank you, they were delicious. I am making loads for Christmas and wonder if I can freeze the dough. Lovely thanks, my daughter in law is off to Italy this week to visit her family, I have put my Hazelnut order in. I decided to make these for our good friends since they were visiting for Christmas. I didn’t want to drag out my food processor so I used my coffee grinder. It gave them a slight coffee flavor that paired well with my Oregon Hazelnuts and Indie Chocolate. Can I use Hazelnut flour? If so, how much? I am very excited to make these cookies tomorrow (or today depending on how long I can wait for the dough to chill!) I am wondering if you have any suggestions on using cream, mascarpone, or creme fraiche to soften the chocolate and make it creamier. I want these cookies now! Hi Mona! If the cookies melt in the oven is usually because your ingredients were not thoroughly combined. Knead the dough until the butter is evenly dispersed. These are Delicious. After rolling into balls, I moisten them with water and then roll them in more ground nuts. Sometimes I also roll them in nuts, bake, then roll in chocolate, instead of doubling them up and again in nuts. Thanks for the recipe.